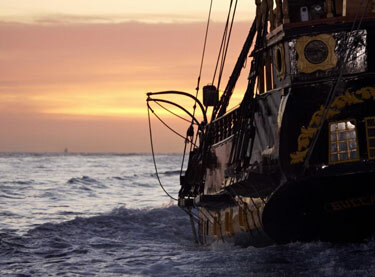 Please send me more information on Buccaneer Queen Tall Ship Cruises! The Buccaneer Queen, a famous, 96-foot ship that has appeared in movies and TV commercials, sails the waters around Cabo San Lucas in epic style. The authentic Buccaneer Queen offers snorkeling tours, sunset cruises, private charters and whale watching trips (Jan-March). The whale watching tours include a continentlal breakfast. Snorkeling tours take you to Chileno Bay to view the incredible marine life and include a full open bar, lunch and even an entertaining onboard pirate fight! The sunset tour takes you past Land's End to the Pacific where you'll enjoy a gorgeous sunset; along the way enjoy the full open bar, appetizers and a pirate show. Sail by Pelican Rock, Lover's Beach, the famous Arch, the sea lion colony and Land's End. The boat then stops, allowing opportunity to take pictures of Cabo San Lucas Bay. The highlight of the trip, of course, is seeing majestic migrating whales and their young calves along the coastline of Baja California Sur. Tour includes continental breakfast, open bar and bilingual certified guide. A fantastic trip on the Sea of Cortez, you will go in search of a treasure at Lover's Beach and we will visit extraordinary places. But our most precious treasures are found in the deep warm waters of Chileno Bay where, along with our crew, you’ll be able to view the area’s magnificent underwater marine life. Tour includes lunch, open bar and snorkeling equipment. Sail in a pirate boat from Cabo San Lucas bay to Pelican Rock, Lover's Beach, the famous Arch, the sea lion colony and Land’s End. Then continue to sail to the Pacific side in front of Divorce Beach and see the luxurious hotels and residences along the coastline. 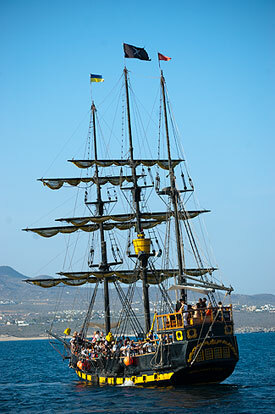 After witnessing a beautiful sunset, watch a pirate show, contests and other fun activities. Tour includes dinner, open bar and Pirate Show. 15% suggested gratuity for crew not included. Please make sure to arrive 30 minutes prior to your tour.